A Replacement Facility for Hillwood High School is being designed for the 274 acre site in Bellevue at the former Hope Park Church location. The new school facility will serve a 1,600 student body in five Career Academies. The building will include modern learning environments which are flexible and technology rich. The 3-story building will be situated on the site along with a new sports complex, parking, and bus access areas. The design concept for this new High School draws inspiration from the history and natural beauty of its locale. Adjacent to the Harpeth River, the site was a historic crossroads of industry and commerce where rail lines and roads carried early settlers west and returned raw materials, including timber and Tennessee limestone, east to Nashville. The school actively engages with the natural beauty of the hills, forest, river, and meadows that define the site. The serrated brick façades are informed by the natural stratification of the surrounding limestone. Sculpted by and set into the topography of the site, terraced academic levels open onto landscaped courtyards and outdoor terraces. Full-height glazing in the commons and cafeteria allow abundant natural light to energize the space while framing courtyard views and expansive vistas of the rolling site. 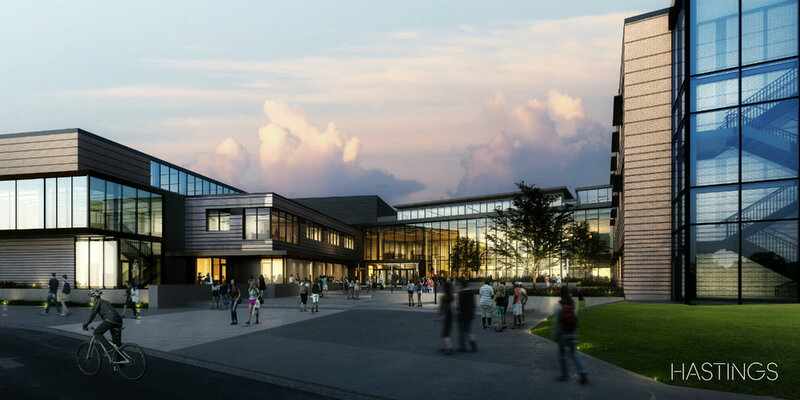 Drawing on the site’s history as a place of meeting and passage, the design for Hillwood establishes a crossroads of learning, bringing together students from diverse backgrounds through the school’s five professional academies. Situated along ample corridors and open stairs, each academy’s unique focus and work is on display for all students to experience, simultaneously projecting an individual “house” identity while inviting inquisitive students to continue to explore and learn. To mitigate environmental disruption to the rolling landscape, athletic facilities - with their large field footprints – are sited in lower, flatter zones. In addition, low impact development strategies employ natural grasses and plant typologies which emulate the natural site hydrology while rainwater is captured for toilet flushing or diverted to bioretention areas that display sustainability as a learning opportunity. The building is oriented to take advantage of solar exposure to control thermal comfort while minimizing glare. A Public Meeting was held on March 7, 2019 to present the design for the replacement facility for Hillwood High School. Click Here to Review the slides from the presentation. The rendering below where shared with the community at the meeting, as well. The Board of Education voted in the Capital Improvement Committee Meeting on Jan. 24, 2017 to request funding for the purchase of land at Hope Park Church in Bellevue in order to relocate Hillwood High School to the site. Student Assignment Data is available for download. Click Here. Diversity Study for Hillwood High School is available for download. Click Here. Traffic Study for the potential Hope Park Church site is available for download. Click Here. Slides of the recent community presentations on the Hillwood High School siting options are available Here.